The Straight-Wire Appliance® has made articulators practical for orthodontists; the quality of the occlusion can be evaluated more precisely than it can be clinically; most patients want an occlusion that will pass articulator scrutiny; approximately 500 orthodontists are now routinely using them; their use leads to higher standards; when articulators are state-of-the-science, they may discourage treatment by those not qualified; good dentists favor referring to orthodontists that use articulators. It is the first articulator system designed specifically for the needs of the orthodontist; it can be used to help diagnose anterior border goals; it is manufactured to tolerances of .005 of an inch; it is made of space-age plastic which will not distort if dropped; it is as accurate as any articulator with the same settings; it has mounting plates that slip on/off (no screws) and are accurately interchangeable among all other Simulator™ articulators; it can display all border treatment goals, not just the distal; it is easy to use; it takes no more time to cast mount than it does to prepare hand-held casts; it is inexpensive enough to have one for every patient; it takes no more shelf space to fit 200 Simulator™ articulators than it does to hold 200 casts that are mounted but not installed on an articulator. Gnathologists and Prosthodontists need adjustable articulators to harmonize reconstructed teeth to deteriorating TMJ's; orthodontists do not need adjustable articulators to construct malposed teeth and to harmonize them with normal TMJ's. EVALUATING OCCLUSION CLINICALLY, WITH HAND-HELD CASTS, AND WITH MOUNTED CASTS (the advantages and disadvantages of three methods that orthodontists use to assess the quality of an occlusion (clinical, hand-held, and mounted casts). Patients will not willingly bite in CR if that is not where the teeth fit best. An accurate clinical assessment of occlusal interfacing, even in CR, is suspect because of tooth mobility. Mobile teeth that deflect or intrude when a person clinches can result in the occlusion looking better than it is. Can learn range of border movements. Can palpate head and neck muscles. Can communicate directly with patients to learn their concerns. Cannot see lingual perspective of teeth. When unmounted casts are set on their trimmed distal borders, only the facial perspective of the static occlusion can be seen. If the casts are held in the hands without the wax bite, what is seen cannot be relied on because all three vertical restraints are exclusively dental rather than two of the three being the temporomandibular joints. How the teeth interrelate when functioning cannot be assessed with hand-held casts. Can see crowns from the lingual perspective. Tooth mobility does not come into play when impressions of each arch are made with materials soft enough to not cause their deflection, and tooth positions are recorded with wax softened enough that it will also not cause them to deflect. When patients are instructed and directed to close into the softened wax in CR it is also important to instruct them not to bite through the wax, for if teeth touch they can deflect if mobile, or if they are not mobile they can cause the path of closure to deflect. Once the impressions are poured, the plaster teeth are not mobile, the plaster teeth have no proprioceptors, and the articulator has no brain. So once the casts are mounted and the articulator is manipulated, an uncompromised picture of the occlusal conditions can be observed. When articulators become state-of-the-science by orthodontists, it may reduce the amount of orthodontics done by general practitioners because it will more objectively show they may not be practicing to the standards of the community. The mounting of casts is a discipline that leads to higher standards. The mounting of casts is an educational and a reassuring experience for the orthodontist as well as the patient. Patients learn before treatment is started the importance you place on treating to centric relation, to functional goals, and to health of the TMJ's. Good dentists respect and appreciate orthodontists that give high priority to occlusion. Mounted casts are a better value for the orthodontist. They provide more information for virtually the same amount of office time and cost. Mounted casts lead to better diagnosis, better results, and to fewer retention problems. How teeth interface in centric relation (CR) and when functioning can be seen facially and lingually without having to deal with the patient's avoidance mechanism (proprioception). Mounted casts take approximately the same total amount of operatory and laboratory time to produce as do hand-held casts, but they provide better information. After the initial investment of the articulator system the materials cost of cast mounting exceeds that of hand-held casts by the cost of the mounting plates and for the bitefork wax. Depending on the system this cost can range from two to five dollars. Gnathologists and Prosthodontists designed traditional articulators for their needs. Orthodontists have adopted them because, until the Andrews™ Occlusofacial Simulator™ Articulator System, there have been none designed by an orthodontist for the specific needs of the orthodontist. Most traditional articulator systems recommend orienting the facebow to Frankfort. This means the bitefork is also oriented to Frankfort. When the facebow is transferred to the articulator, it is oriented to the articulator's upper member, which is parallel to the articulator's transverse plane, not to the articulator's Frankfort plane, because articulators have no Frankfort plane. In the population the range for the angle between the head's transverse plane and Frankfort is reported to be 30°. The SI distance between those two planes at the front of the face can be 50 mm. This means that the SI position of the front end of the cast's occlusal plane can be 50 mm different on the articulator than it is on the patient. The occlusal plane orientation to Frankfort is satisfactory for those in dentistry that deal with dental reconstruction, but not for those involved in improving the harmony of the entire orofacial complex. Traditional articulators are too costly for orthodontists to have one for each patient. This means that one or several articulators are used for all patients. An orthodontist may see 30 or more patients in an afternoon, a gnathologist may only see a few. With only one or two articulators, the orthodontist must remove and replace casts numerous times throughout the day. This involves presumably adjusting the articulator to each person's customized settings, retrieving the casts from a cabinet, removal of rubber bands that hold casts together, screwing them on the articulator, unscrewing them from the articulator, replacing the rubber bands, and refiling each patient's casts. This is time-consuming and involves extensive handling of casts-which is potentially hazardous to casts. The important lingual perspective of the teeth is partly obstructed by the design of most traditional articulators currently available. Partly or fully adjustable articulators are, for all practical purposes, more sophisticated than is realistic for the practice of orthodontics. At this time, orthodontists are not capable of estimating posttreatment rebound exactingly enough to justify the use of adjustable features that have been customized for the patient. We can routinely treat to centric relation (CR) and, with a fully programmed appliance, we can efficiently treat most patients to the Six Keys™ and to the Canine Rise functional standards, both of which can be verified, for most orthodontic patients, from average TMJ settings. Realistically, we cannot interface the teeth as precisely as can be done with wax crowns, or with denture teeth set in wax, so we must, to some extent, hope for favorable settling and later, if necessary, equilibrate. Average TMJ settings also work for splint making and for most equilibrations. Adjustable articulators may be needed for patients with deteriorated TMJs, but that is rare for most orthodontic patients. * Patent No. 5,176,515. Bitefork Tab with Stem, Mounting Plates, Patent Pending 1998. ™ Lawrence F. Andrews, DDS © Copyright Lawrence F. Andrews, DDS, 1998. Traditional articulators display only the posterior border goal for the dentition (TMJ) because gnathologists do not deal with the other borders. Orthodontists and surgeons do deal with all borders, and for them, it is very helpful to have all border goals displayed. If dropped, traditional metal articulators can be permanently damaged. Traditional articulators are impractical for ABO presentations, because ABO Directors will not remove and place casts. 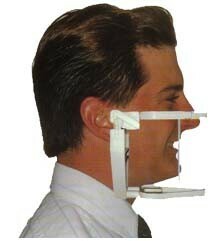 For those that cast mount this means a minimum of three articulators is needed for each patient. That many articulators is cost prohibitive and difficult to borrow. Traditional articulator systems are not designed to assist in AP diagnosis. How to use the Simulator™ articulator can be learned from a manual, courses, by appointment in Dr. Andrews' office in San Diego, or by appointment in your office. * Patent No. 5,176,515. Bitefork Tab with Stem, Mounting Plates, Patent Pending 1998. ™ Lawrence F. Andrews, DDS © Copyright Lawrence F. Andrews, DDS, 1998.